Digital signage is improving the way educational establishments communicate. Traditional paper based mediums like notice boards and printed materials are slowly being replaced with a far more efficient and cost saving system, that is digital signage. 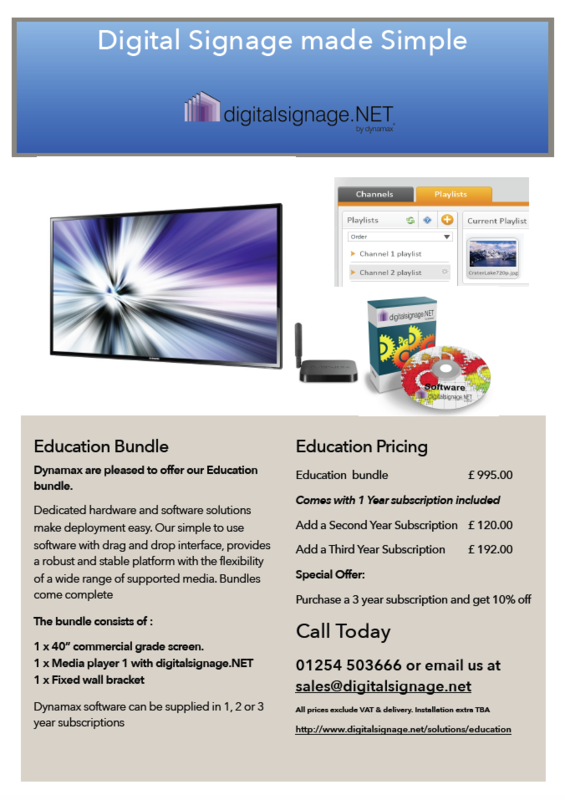 Our education bundle provide a cost effective way for education institutes to start to make the change from paper based messaging to digital messaging. Placed in the correct location, a digital display (or displays) allows important and relevant messages to be targeted to pupils, visitors and staff members. Dynamax, and our simple to use digitalsignage.NET software, will allow you to take control and easily manage your communication strategy. *Please note: Delivery and installation are not included in the above offer. Should you require installation, please advise your location and number of screen installations required.